The CBD is a special assessment district into which property owners contribute money to ensure the district is safe, clean and promoted. The help of property owners allows us to continue the tremendous success of the KONO Community Benefit District. Check out our accomplishments to learn more about what we've achieved through the support of property owners. Your help is still needed to take our community into the next phase of economic growth. In 1999, the Oakland City Council approved the Oakland Property Business Improvement District Ordinance (Ord. No. 12190 C.M.S). This legislation allows for the formation of property-based assessment districts (CBDs) to undertake a range of services within an assessment area, independent from government, to further the development and economic viability of an area. Property owners along Telegraph Avenue from 20th to 35th Streets in Oakland voted to approve forming a CBD for that area in July of 2007. They were unhappy about the long economic decline of the area and wanted to band together for positive change. The goal was to create a strong advocacy group that would bring resources and attention and make the area more attractive for visitors. The small residential population could not support widespread economic revitalization, so outside investment from the district's large number of Korean-American property and business owners was targeted. They approved calling the new CBD Koreatown Northgate, which reflects both new investment and the existing neighborhood. The CBD works to build strong community relationships among property owners, merchants and residents. There are 8 volunteer members on our board of directors. They are residents, business owners, and/or property owners in the CBD. One 3/4 time and one 1/2 time staffis employed to complete all administrative duties. Property owners contribute approximately $308,000 each year into the CBD. The assessments are an addition to each owner's property tax bill. 55% of funds are used for Public Right of Way Sidewalk Operations (PROWSO). 25% of funds are used for administration. 15% of funds are used for marketing and identity. the City and County for collection costs. Meetings takes place at the KONO office (2301 Telegraph Ave. Oakland, CA 94612). Ring doorbell at the back gate on 23rd street. KONO website created by LocalOn allows merchants to post events and coupons directly to the site. 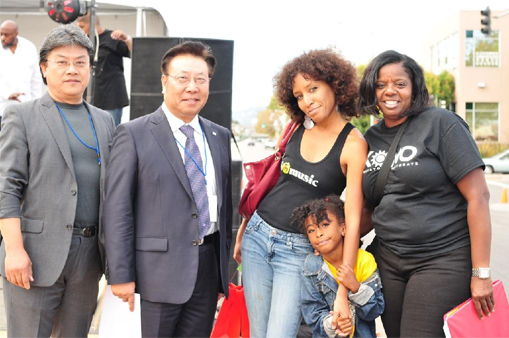 Promotional partnerships with East Bay Express, Korea Times, Oakland Local, and Oakland Grown work with merchants to drive business and encourage local holiday shopping. Art in vacant storefronts and on utility boxes highlights local talent and attracts businesses to the area. Street banners enliven and promote the district. 83 trees restore greenery to Telegraph Avenue. The CBD organizes a yearly multi-cultural street festival. Submit your property to be listed on this website.